It hasn't been as spectacular as most of us expected it would be, since last night's clash between Real Madrid and Manchester United at the Bernabéu ended up with a 1-1 draw on the scoreboard. The Red Devils held on quite well to the pressure made in the early minutes of the game, where the Merengues pushed forward with high intensity in their seek for the first goal. However, it would be Danny Welbeck getting the opener, after he met a perfect corner-kick cross from Wayne Rooney. United's goal didn't bring Real Madrid down and whoelse but Cristiano Ronaldo to score the equaliser and put the Merengues back in the game. The Portuguese superstar brilliantly headed a cross from Di María into the back of De Gea's net, but preferred not to celebrate his goal as a sign of respect for Manchester United and their fans. 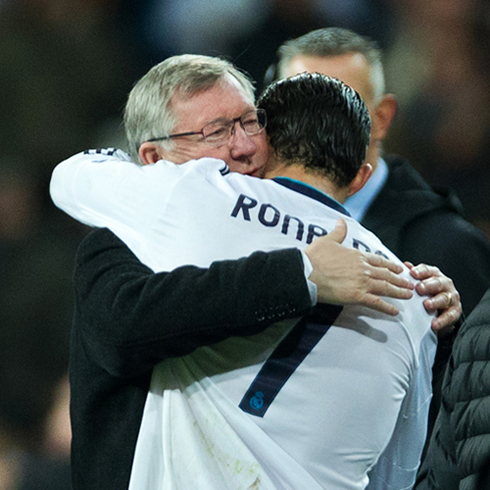 Sir Alex Ferguson decided to bring on a couple surprises on his line-up for the Santiago Bernabéu. One of them was to put Jonny Evans as a center defender, replacing Vidic who appearently didn't recover from either fatigue or a minor injury picked up in last Sunday's match against Everton. 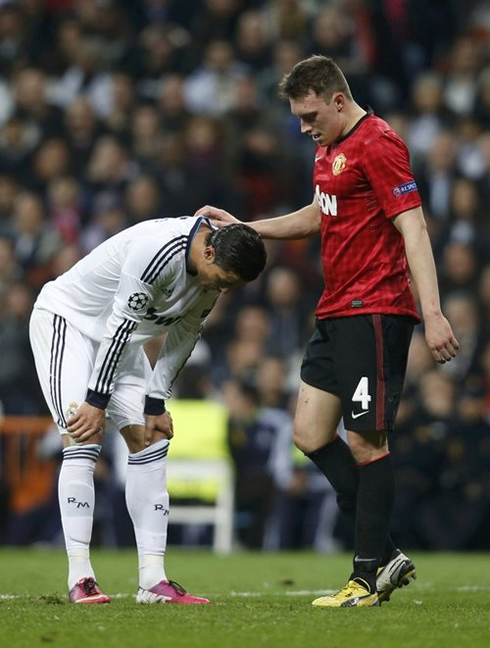 Another surprise was to play with Phil Jones in midfield and put him in charge of marking and defending Cristiano Ronaldo. As for the attack, Wayne Rooney, Robin van Persie and Danny Welbeck were all starters in this game, which denoted Sir Alex Ferguson's clear intention of getting at least that always precious away goal. Real Madrid still couldn't count with Pepe for the full 90 minutes and so Varane stepped in to fill his spot. Apart from that, Mourinho didn't bring any surprises and the home side went on to this game with its traditional line-up. With 20 minutes played, United earned a corner on their left attacking side. 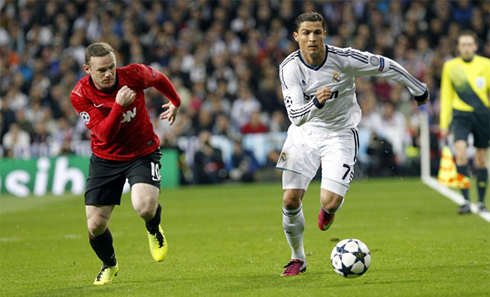 Wayne Rooney took it and made a cross to meet Danny Welbeck well inside Real Madrid's penalty area. The English forward found no opposition and headed it past Diego López, to make it 1-0 for Manchester United. Unsurprisingly, the Merengues conceded another goal from a set-pieces play and the blame has to be shared between Sergio Ramos, who didn't mark Welbeck properly, but also Diego López, who didn't go to meet the cross as he should have done, given into consideration how close the ball actually crossed his intervention area. Real Madrid had started the game with the left foot, even though they had been the better side until that moment. Fortunately, Cristiano Ronaldo didn't seem to be negatively affected by the emotional charge of the game and alongside with Fábio Coentrão and Angel di María, he made sure Manchester United never felt completely safe on the back. Just 10 minutes after Welbeck's opener, the Merengues responded and equalised the encounter. Angel di María made a long curled cross on the left and saw Cristiano Ronaldo jumping high and hanging in the air as many NBA basketball players aren't capable of. The Portuguese raised to the second floor and with a perfect header gesture, he beat De Gea for the first time on the night. 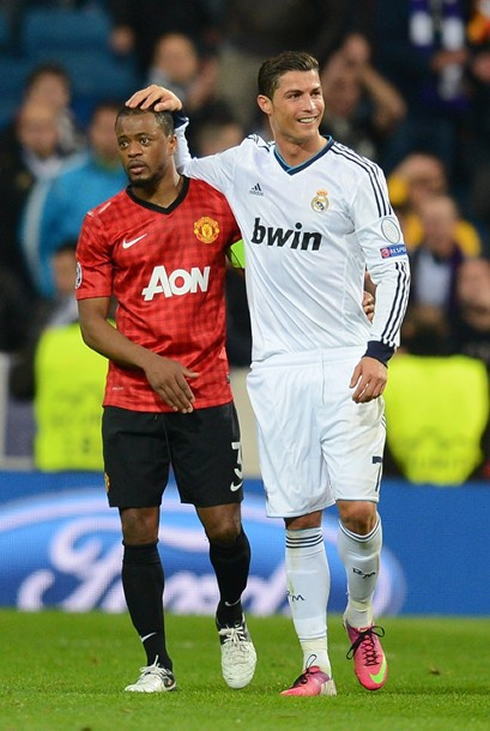 Last December, Ronaldo had promised that he wouldn't celebrate if he was to score against Manchester United and the former Red Devil player kept his word, as he refused to pull off any celebration as he usually does. 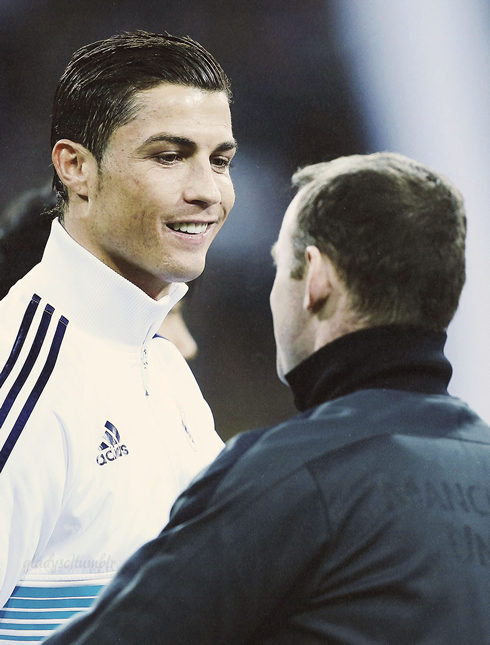 Cristiano Ronaldo next game for Real Madrid will be a special one against his former club, Manchester United, on February 13, 2013. You can watch Juventus live stream, Real Madrid vs Rayo Vallecano, Sparta Prague vs Chelsea, Zenit vs Liverpool and Tottenham vs Lyon, all matches provided from our soccer live page.